Believe it or not, golf carts didn’t really catch on when they were first introduced in 1932. From the 1930s to the 1950s, they were mostly used by people with disabilities so that they could get around more easily. The 1950s was when they actually become popular. Merle Williams used his experience with electric cars during the World War II gas rationing. At first, his electronic buggies were most widely used for women when they went grocery shopping. They also became popular with golfers in the 50s. Big names like E-Z-Go and Club Car were manufacturing and distributing electronic golf carts beginning in 1954 and 1955, respectively. In 1957, Max Walker was known for creating the first gas powered golf cart, which was a three wheeler designed to carry two passengers with bags. Harley Davidson – now there’s a name we all know – manufactured and distributed thousands of these three and four- wheeled fuel powered and electric vehicles. In fact, their iconic three-wheeled gas cart had a reversible two-stroke engine which is actually used today in some high-end snowmobiles! Harley sold its golf cart production end to Columbia Care Company in 1982. Today, Club Car and E-Z-Go maintain their popularity, along with Gem. And some of our own family history in golf carts. 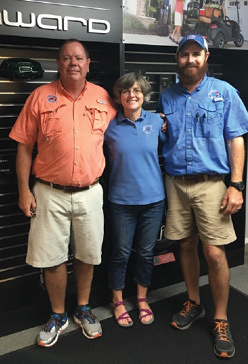 . .
Jim Noland, (father of Carrie Noland Welsh now owner of Gulf Atlantic Vehicles, Inc.) his wife Betty and his brother Dale Noland started Noland Car Company in the mid-1970s. Prior to starting their own golf car manufacturing business, they were a Pargo golf car dealer. When Pargo went out of business, Noland and his family began building their own vehicles since they had a solid customer base and orders. One of the largest customers of Noland Car Company was Walt Disney World in Orlando, Florida. Almost every resort on the property had Noland’s vehicles, and the cars were designed according to the theme of each resort. Some notable Noland Car dealers who are still in business today, either making their own vehicles or carrying other brands, are: M&amp;M Vehicle Corp. in Missouri, B &amp; W Golf Cars in Florida, Satch Sales in New York and Country Club Enterprises in Massachusetts. In 1987, Cushman purchased Noland Car Company. They continued to build their vehicles in Edgewater, Florida, for several more years and then moved the facility to Lincoln, Nebraska. Eventually, Cushman was sold to E-Z-GO in 1998. Jim Noland passed away on June 26th at the age of 74. Mr. Noland is survived by his wife Betty, brother Dale, daughters Carrie Welsh and Deanna Ford, four grandchildren, and three great-grandchildren. Gulf Atlantic Vehicles in New Smyrna beach carries the top lines of both gas and electric golf carts and offers hundreds of options and accessories to create the perfect custom vehicle for your needs. If you are interested in purchasing a high quality, affordable golf car, please feel free to stop by our convenient location on Pioneer Trail or call us at 386-427-9778.